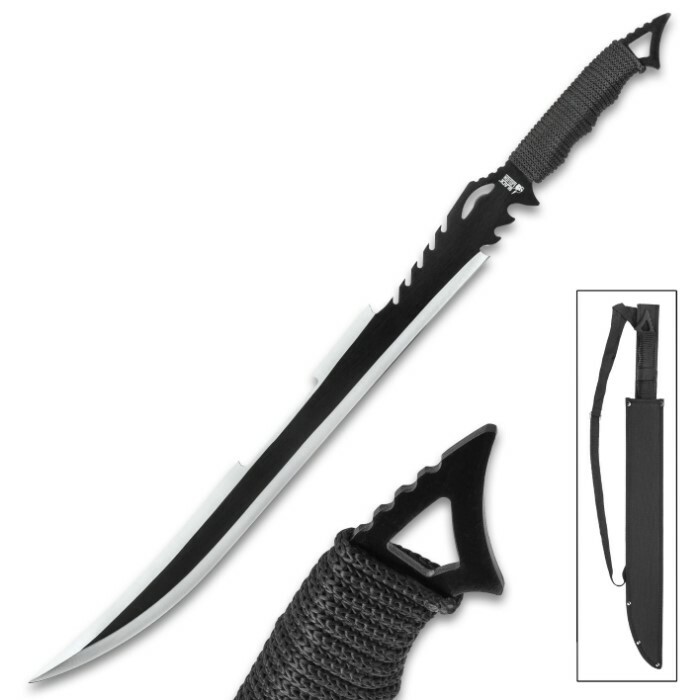 Black Legion Death Stalker Sword with Nylon Sheath | BUDK.com - Knives & Swords At The Lowest Prices! A sinister-looking weapon with the bite to back it up, Black Legion's Death Stalker Sword drips with dark, brooding style and ferocious cutting potency. 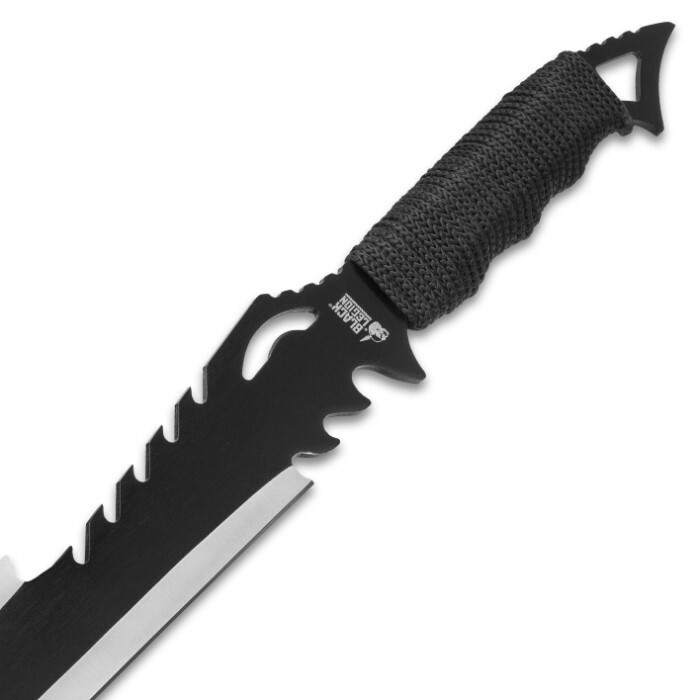 The bladed menace is forged from a single piece of tough stainless steel, shrouded in an ominous black finish that underscores its wicked ferocity. Only the carefully honed edges of the Death Stalker's 18 1/2" blade are left exposed, yielding a dramatic visual contrast that impeccably complements the blade's sleek lines and delicate curvature. Jagged, fang-like cutout embellishments between the blade and handle smartly perpetuate the Death Stalker's bleak-chic motif. Wrapped in durable black cord, the tastefully minimalist handle makes this one-piece black beauty a pleasure to wield, even for extended slashing sessions. The stylized barbs at the pommel's corners echo the craggy cutouts below the handle. Combined, these jagged claw-, fang- or horn-like accents impart the Death Stalker with a fierce animalistic, almost predatory vibe that's sure to dishearten any foe who dares to confront it. 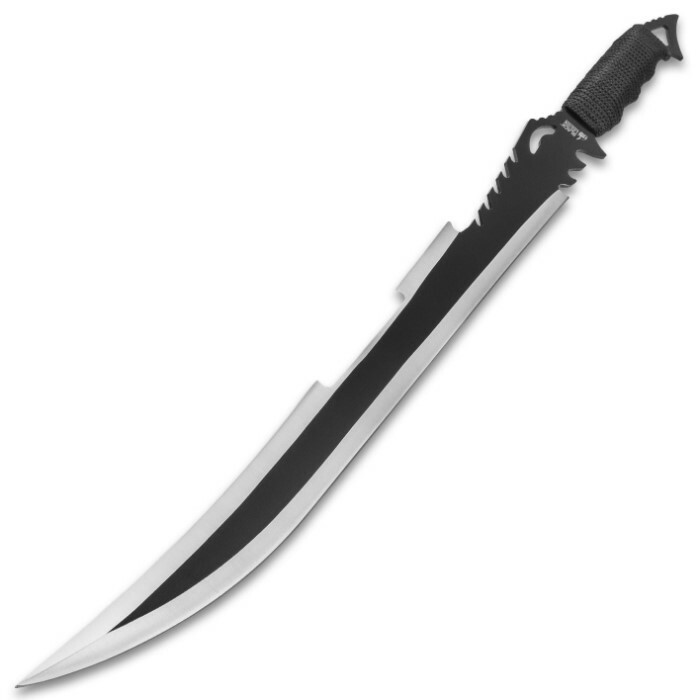 But don't forget - the Death Stalker is a serious weapon with serious cleaving clout; this is no mere fantasy sword, intended to be relegated to a wall or display case. 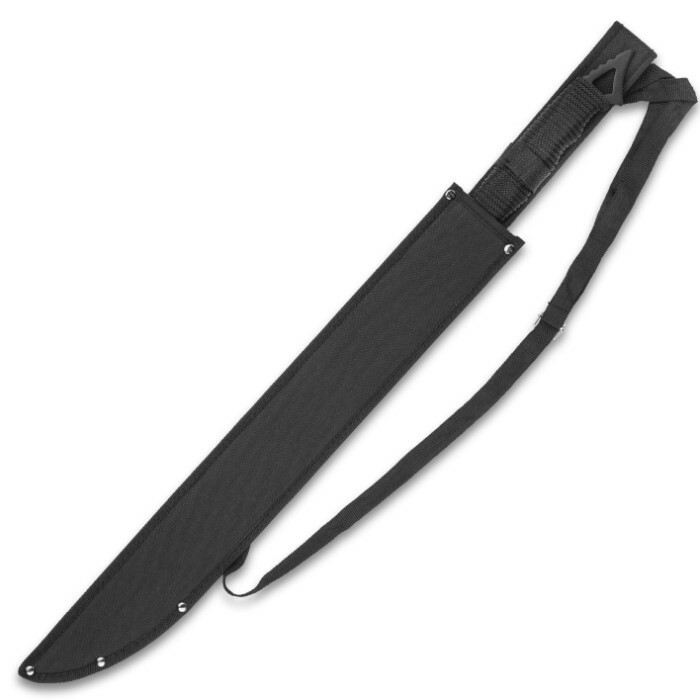 The included heavy duty black nylon sheath makes transport a breeze - no matter where you "stalk" your prey. Whether showcased in a collection or brandished in the field, Black Legion's menacing, savagely beautiful Death Stalker Sword has an eerie, almost unearthly ability to attract attention and reverent awe from all who lay eyes on it. This is the first sword I've ever ordered. For the price, it's not bad. The blade comes fairly well sharpened and the sheath is not as bad as I thought it would be from the other comments. When you sheath/unsheathe the sword, lightly press the bladed side of the weapon into the sheath wall. This prevents the odd looking back side of the blade from snagging. Also, this is a one-handed weapon, so If you fight with two hands you should look at a different weapon. The blade was slightly scratched when it came. Well made fairly sharp accurate description, delivered in a timely matter. 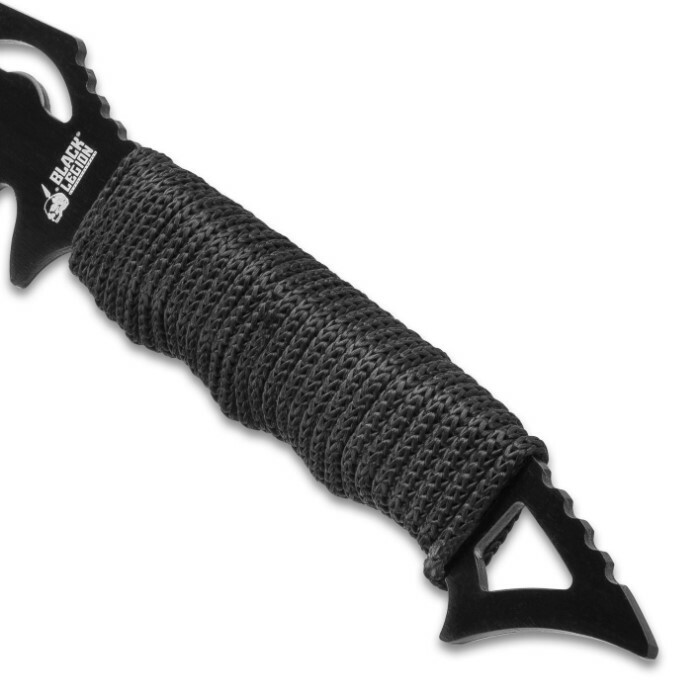 definitely very happy with this purchase, as described, came very sharp out of the box, not a huge fan of the paracord wrapped handle, but that's easy enough to fix, going to put a wooden handle on it, planning on purchasing another one soon, Great blade ! This is the first sword I've bought and I love it.Super well made worth every penny Great site Budk.Will be ordering again and again. I bought this sword a while back and have had nothing but good service from it. Came very sharp. Not razor, but close. Had a bit of issue with cord loosening after some use. Fixed that easy enough with some Zap-A-Gap. This is basically a super glue for material and plastic. I liked the overall shape and look of the blade. It has a very dangerous and intimidating look to it. The sword also comes very sharp, and there is no need to sharpen it.The one thing I want to note is that after a few swings, I started noticing that the nylon cords on the handle were shifting and eventually fell off. The sheath is not the best quality, because if you don’t put the sword in properly, it will rip and the sword with fall through. It is a great sword for its price, and I would recommend it to anyone for $10. I bought this as my second order from budk and also Black Legion, I’m impressed with the absolute razor sharpness of the blade, but as others have noted the sheath is a pain to get it out of. I’d hate to need to draw this quickly for defense and have it stuck! But when it does come out, I’ve yet to find a better way to drop $10!! I put off buying this one for a long time. I bought the red death stalker a few years ago instead of this one. I like this one WAY better. The red one is dangerous to the user. This one isn't. This one is thinner, lighter, but just as sharp. Even the sheath is better. Can't wait to mess stuff up in my back yard with this one. Thanks BudK. Black Legion rules! I like the weight of the sword. It's well crafted and surprisingly sharp. The sheath is ugly; I immediately threw it in the trash because I didn't really need it. Am very happy with the sword. Only issue is with the few scratches on the blade an near the handle. Is sharp an tip is fine. I'll gladly recommend to family and friends. Groovy deal.